Hello everyone, I’m back… I have to start by saying that I’m sorry to have dropped of the face of the earth back at the end of August. I had some health issues through the winter that started back in September. It made for a very long winter to say the least. I’m very happy to say that I feel back to normal now and that I’m getting itchy to start gardening. We had a great winter this year with very little snow. Many locations quite close to me had several huge snow storms. All we had were a few storms with four inches of snow at the most. My front and back gardens are starting to wake up. There are a lot of signs for an early spring. Now that I’m feeling better I’m getting very anxious to get out there. Looks like I have a lot of catching up to do on blogs and photos that were posted. This is a photo of my first little patch of Crocus to open this year. 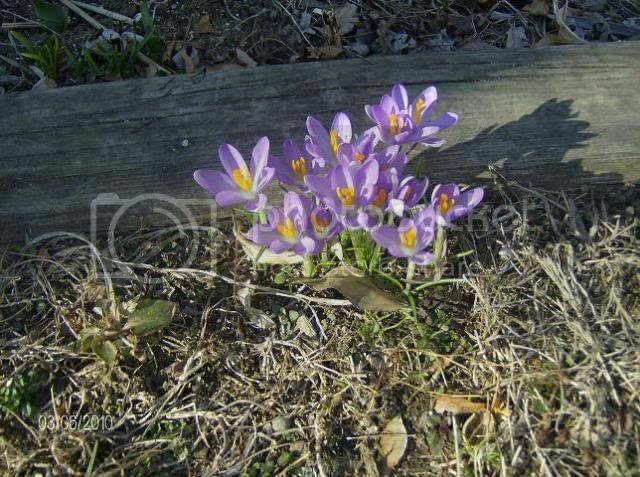 Glad to hear you're feeling a lot better ... that's a beautiful patch of crocus! Glad you're back on your feet again Mike, some gardening will be therapeutic for you. My, you have been lucky with the amount of snow. I visited your lovely State back in the 60's but that was mid-Summer. I imagine that it.s beautiful in Spring. Where I live we get many visitors from the States, I'm a big supporter of the 'Special relationship' and often enjoy a chat to your fellow Countrymen. glad you are feeling better, Spring does lift the spirits and I still feel excited when I see the garden on the move again. we have had our fair share of snow in southern England followed by cold winds(which I hate !) but looking forward to the warmer weather. Welcome back Mike... and better health for you in 2010. Welcome back, Mike and so glad you are feeling better. Look forward to seeing more of your lovely gardens this summer. Sounds like we had more snow than you :) Take care. Hi MikeC, I am so glad to see you on here again, I wondered where you were. Glad to hear you are better. Look forward seeing some pictures of your garden. So pleased your back with us and you are feeling better, thought you had left us, but so glad you have'nt. Hope your OK now ..Hope you got my pm i sent sometime ago..
hope you have a lovely spring and a healthy gardening year Mike. Welcome back Mike,and glad you are feeling much better.Its been a long cold winter pretty much everywhere...Spring is very welcome ! Thank you so much for the warm welcome back everyone. It's nice to hear from you Mike. I hope you are all right now. I'm looking forward to your photos and blogs. I have changed my user-name since you were on last. Hi Jacque, My pond is finally water and not solid ice. It wont be too long before I get the pump going in it. Funny that you should ask about my pond because I've been thinking this week about maybe doing a bigger one. I've been going through my photos that I have of the pond to see how I could go larger.